Getting tired of rain here, which has sent me looking for news about precipitation. It seems that good rains earlier this year in Burundi have meant good crop yields, according to he UN’s information service IRIN reports. Crops are so abundant that “prices in some markets had significantly dropped. A kilogram of beans in Kirundi now goes for 200 Burundian francs (US$0.16) from 600 francs ($0.40) previously,” the press release says. That’s good, probably, although it points out a basic problem with farming: growing crops, as Laura Ingalls Wilder’s daughter Rose noted long ago, is basically gambling against the weather. If a farmer doesn’t get enough rain or gets too much, he loses when it comes to yield. If the season is good and he gets a bumper crop, he may lose also, since prices will drop as supply increases. I thought of that sad truism today, as I watched the rain fall here for the Nth straight day. The news earlier this month had been that Saskatchewan and Alberta had received so little rain that a very bad drought was shaping up. A little of the moisture that has been falling around here could be spared for there, it seems to me. This just in: Of course, weather systems are never that simple, and it seems it rained a fair amount on the Prairies over the weekend. But as I head out to the Jean Talon Market to see if the local strawberries are any good, despite the wet weather, I marveled again at the faith that must go into deciding to farm. Times have changed, but the risk continues. And it's worse if you do it alone, as a a couple of stories in the Globe and Mail points out. Today's item reports that Mario Bouthillier, the handsome Quebec farmer featured, made the rounds of talk shows yesterday to explain the problem. “Hey, it's raining non-stop, I can't get in the field, so it's a good week for it,” he's quoted as saying.. This morning I had intended to draw your attention to a scary piece in The New Yorker of May 25 by Elizabeth Kolbert, “The Sixth Extinction,” but a CBC radio program about the crisis in journalism these days intervened. The Kolbert story—which suggests strongly that humans are the cause of what may become the sixth massive extinction of life forms on earth—as well as a recent article on costs in US health care by Atul Gawande, “The Cost Conundrum,” are the very best sort of intelligent investigative journalism. In both cases, the writers must have spent months on the stories, building on years of interest in a particular field. It is exactly that sort of careful, time-consuming journalism that Ira Basen says is under threat in his report “News 2.0: The Future of News in an Age of Social Media” which aired on The Sunday Edition. It used to be that editors and reporters had a chance to weigh and consider the veracity and importance of news before it was disseminated. With the rise of cell phone videos and instantaneous web access that has gone out the window. The emphasis is on immediacy, and the business model—where advertisers and subscribers pay for journalistic expertise--which supported print, radio and television journalism is crumbling before its onslaught. It’s very clear that the transformation of journalism is undergoing is not going to pay people to do the kind of thinking that lies behind Kolbert’s and Gawande’s pieces—nor, for that matter, Basen’s report. But perhaps we should also realize that journalism as it has been practiced has its grave defects too. Dean Starkman, for one, has recently chastised the business and financial press itself on the way it failed (or maybe refuse) to see what was coming before last year’s major economic meltdown. “If the question is: Did the press provide adequate warnings to the public? The answer would be: No,” he told an audience of financial journalists recently. In this case, it may be the current business model which was at fault—who paid for all those reports over the years but the investment bankers, trusts, and other high finance wizards advertising in the financial press? As I noted last week when talking about the Quebec government increasing its advertising budgets: those who pay the piper call the tune. And when you’re building a house (or pyramids to finance housing) of cards, you don’t want anyone to look too closely. So what’s the answer? Many voices, I suspect, but somehow ways must be found to pay some people to spend the time necessary to reflect and weigh the voices, too. Twittering is mindless, context is important, editing is all. I note, by the way, that the Kolbert article is available for free only in summary on the web, but that a full digital edition is available to New Yorker subscribers--or one can by a copy of the article. Is that the way things will go? Stay tuned. What a difference a few months makes! 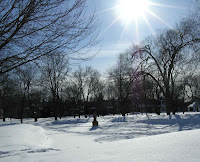 The picture on the right was taken last March as winter was winding down, while the one ot the left was taken last week. Election Fraud at Home and Abroad: Hanging Chads and "Hanging Chador"
The sad events in Iran continue to trouble the world. I admire the brave folk who have taken to the streets there in the last 10 days to protest what appears to be election fraud, but I think it’s also important to recognize that elections have been stolen in countries whose experience with democracy is supposed to be much longer and stronger. I am referring, of course, to the US presidential election of 2000, where “hanging chads” and systematic intimidation of potential voters made the difference between defeat and victory for George W. Bush. The cover of the June 29 New Yorker makes a sly reference to that fiasco. A young woman in green hidjab is examining a punch-card ballot. “Hanging chador” it’s called. Let those without sin cast the first stones. And where were the mass demonstrations in the US eight and a half years ago? The Quebec government increased its spending on advertising by 25 per cent in 2008-2009, Presse Canadienne reported on Monday. Total ad buys in all media—television, radio, newspapers, magazines, Internet and billboards--were up $10.7 million from $40.6 million in the previous fiscal year. The figure was $37.9 million in 2002-2003. Marie-Claire Ouellet, associate general secretary of the provincial agency responsible for advertising, said the increase was “not exceptional” and explained that $3.7 million of the increase went to promote energy efficiency while the Ministry of Culture and Communications doubled its advertising expenses to $2.7 million, including $1.2 million to promote the French language. That may be, but Premier Jean Charest appeared in an awful lot of the ads in the months leading up to last year’s provincial elections, Stéphane Bédard, spokesman for the opposition Parti Québécois is quoted as saying. Could be: institutional ads are a way for a government in power to get across any message it wants. But another, unmentioned motive may be a desire to take up some of the slack left when commercial advertisers began slashing their budgets when the economic crunch came last fall. Buying advertising in newspapers and electronic media is a way to get on the media’s good side, particularly in bad times. He who pays the piper calls the tune, as we all know. Summer's Here, the Pink Bicycle's Back: Happy Fête nationale du Québec! Summer has truly arrived. 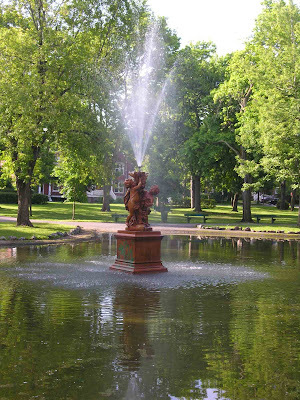 Not only are we a couple of days past the solstice, but today is St. Jean Baptiste or the Fête nationale. Once a feast day in honour of Quebec's patron saint, the holiday has been expanded to include everyone who calls Quebec home: when some dinosaurs protested a couple of Anglophone bands performing at a festive concert, voices were nearly unanimous in denouncing the chauvinism. The other sign of summer is the appearance of the pink bicycle. 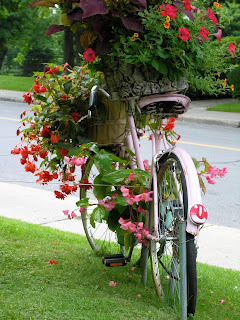 For the last several summers, one family has decorated an old bike with flowers, making a most original arrangement. This year I was wondering what had happened, since the flower beds had been planted with annuals, but the bike was nowhere to be seen. Then last weekend I happened to pass the house on my walk when the owner was out. When I told him that I’d been wondering if all was well with the family, and how charming we find the bike, he promised to put it out as soon as possible. And there it is now, just as cheerful as in past years. When I saw what the folks at the day care which my kids attended had done to the patch of ground in front of the entrance, I was delighted. While a great deal of effort has gone into making the Garderie Querbes a well-equipped centre for early childhood education inside, the outside has languished. Every couple of years a few parents of children in the day care or in the school in which it’s located, get together to do something about a garden. 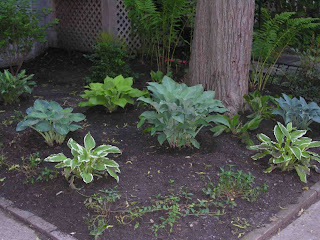 Last year the space in front of the school itself was planted with perennials which survived quite nicely, but until a few weeks ago not much had been attempted in front of the garderie’s entrance. Then one of the teachers along with the man who lives upstairs decided to redo the bare patch. 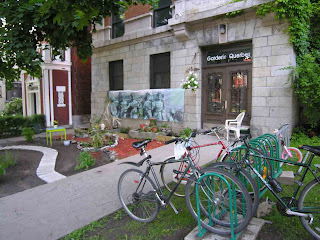 Over a couple of weeks a mural, a winding path, a few plants in pots, a little fence appeared. It looked lovely, and I saw several people stop to admire it. But when I passed this morning—the last day of school in these parts—it had disappeared. I went in to find out why and was told that the collaborative effort foundered on the difference between what is safe for little kids and the other party’s ideas of what was good garden design. So the dangerous elements were removed and, for the moment, all that remains is the crushed rock from the path and the bicycle stands. Grass is supposed to be planted shortly. What a shame that something more interesting couldn’t be worked out. How does one learn to write? By writing, of course. But is learning to write best done that on one's own? Or is it best nurtured in a group, with a mentor, with the support of like-minded souls? But most of the students in these programs may never be published, and certainly many of their teachers are not well-known even to avid readers, Menand notes. One of the things the programs do, however, is to encourage the passion for writing and reading, and Menand contends that may be as important an accomplishment as turning out literary stars. I’d add that providing an income for writers is another accomplishment of the programs that should not be underestimated. Menand says that in 1975 there were 15 creative writing programs on the master’s level in the US, but that today there are 153. I don’t have similar figures for Canada, but factor in the number of creative writing classes offered at various levels taught by writers, and you get a nice supplement to the nearly non-existent income most famous writers get from their writing. Teaching a creative writing class or two a year often makes the difference between poverty and a more-or-less middle class life. Not that I’ve ever taught. I’ve used that other writerly strategy: team up with somebody who has a good day job! It's one or the other for those of us who haven't joined the rich and famous, it seems. Well, summer officially begins tomorrow, but when I was in Portugal a couple of weeks ago, the fish appeared to be jumping. This was taken a ferry's ride across the Tagus River from Lisbon in Setibal where obviously some people think it's worth fishing. 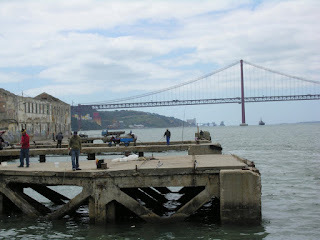 The bridge in the background is the April 25th bridge, renamed that after the bloodless revolution which changed Portugal's politics from right wing to centre left in 1974. Before that it was called the Salazar Bridge after the dictator ruled the country for more than 30 years. The bridge, the estuary and bay, as well as the vegetation made me think of San Francisco. As I wrote Lee the first day I was there, Lisbon makes me think of a smaller Paris set down in California. Consider this a head's up: the Montreal Baroque Festival begins next week, celebrating Henry Purcell. Les Voix Humaines will be playing his fantasies on Thursday evening, music which is featured on their new CD. Elin is part of the consort of viols and you can see her in the video: she's the one in the purple sweater. Quite an interesting story about the magnificent viols which will also be played on Thursday. It was a bad idea to begin with, and maybe the truth is beginning to dawn on those who were ideologically in favour of Public Private Partnerships. Quebec’s Premier Jean Charest—who was, never forget, briefly leader of the Progressive Conservatives after he spent years as one of Brian Mulroney’s right hand men—was all for PPPs for highway and hospital construction. So were many of his most influential cabinet ministers. But the dismal record of PPPs—cost over-runs, long start-up times, and threatened bankruptcy of private partners—appear to be making even the blind see. In the case of Francophone super hospital, two architects’ groups say that the agency supposed to coordinate the PPP is not well-organized, and waiting for it to receive bids from consortiums on how to manage the project is wasting time. Better to use the plans drawn up in consultation with the medical staff involved and go directly to bids on elements of the construction of the project. This method was used productively in the past for the construction of airports and university buildings in the past: the projects came in on time and under budget, André Bourassa, president of the Ordre des architectes, told Le Devoir. Minister of Health Yves Bolduc admitted Tuesday that PPPs aren’t the “religion” of the Charest Liberals. The rebuilding of a major highway interchange is also supposed to be undertaken by a PPP, but both the competence of the PPP agency to direct such a project as well as questions that of the companies who might bid to become the constructing consortium have recently come into question. Not a minute too soon, if you ask me. Setting up PPPs only opens the door for more profit-taking by the companies involved. We don’t need that, particularly in these times when the defects of right wing economics have sadly affected us all. To step outside this morning was to step into cloud of warm air and the smell of Russian olives in bloom. Too bad there’s no scratch-and-sniff feature on the Internet so far, because it would be a pleasure to share it. In this climate the smells of growing things are particularly welcome, after the long season of cold. The first is the damp smell of newly-bared earth, followed by what I can only qualify as a “green” smell. Not one plant is yet in bloom, but there is a soft, sweet smell in the air. By now we’ve passed the season of the heady scent of hyacinths (too strong a smell for me: I don’t plant them) as well as that of lilacs. Peonies are beginning to bloom, the mock orange will soon be out, and the Russian olive on the corner is covered with its small yellow flowers, disproportionately full of fragrance. In some places the tree or shrub is considered an invasive pest, but here the winters are so severe that their spread is kept in check, and we can enjoy the odd specimen that does survive. That last is a memory from my California childhood. I guess that, even though I wasn’t much interested in gardening then, the odors of growing things made their way into the deepest corner of my mind, like Proust’s madeleine. I’m not going to mention her name or give a link because that would only make matters worse, but the essay by a mother about how she threw her angry slacker son out of the house in yesterday's Globe and Mail deserves comment. The story isn’t unfamiliar. Anyone with kids knows of a similar one: young man has a chip on his shoulder, doesn’t know what to do with himself, gets involved in soft drugs and petty crime, seems headed for perdition. His parents despair, may have to employ some tough love and send him off on his own. The difference in this case is that Mom writes about it in Canada’s National Newspaper. She recounts the 19 year old’s anger, her frustration, the attempts she and his father made to turn him around. And then she tells how they locked the doors and put his suitcase outside, how they watched from the window when he came back to pick it up and then walked away laughing with his friends, how she likes a picture of him where his face doesn’t show. That's tough love, for sure, and tough love sometimes is necessary. But this woman has gone beyond that: she has humiliated publicly someone she says she loves. One of the constants over societies is that young men who start out wrong, frequently after many, many twists and turns, end up leading a not-too-terrible life. My grandfather David McGowan (or MacGoun, he spelled it both ways) appears to have been one. He left Napanee, Ontario, at 16 in disgrace for reasons now lost in the mists of time. He fetched up in Walla Walla, Washington 12 years later as a barber who became well respected in the community. My other grandfather says he held a sort of philosophical salon on Saturday mornings where the president of Whitman College and other local luminaries gathered to talk ideas, books and politics. The young man who is the subject of the essay may end up doing that well. I hope so. But if I were he, I would be even more furious at the way Mom has appropriated his life, showing her disdain for him publicly. This is an essay about her, written for her own reasons, which will make matters worse, not better. If her aim really were to help her son, she would have done better to keep her own anger confined to a circle of friends, family and counselors. She's got a day of fame, though, and maybe that's what she wanted all along. You'll remember that after a harried appearance by Harper at a tribute to the Canada Council for the Arts in spring 2007, Martel began sending a book every two weeks in order to provide some good bedtime reading for the PM, so that he could enjoy a little “stillness.” The first gift, The Death of Ivan Illych by Leo Tolstoy received a short note, but there was silence for the next 55 gifts. Then suddenly in May people in Harper's office began to send notes of acknowledgement. Regardless of the PMO’s objectives, it seems Martel may have an ulterior motive for continuing his campaign: What is Stephen Harper Reading? Yann Martel’s Recommended Reading for a Prime Minister (and Book Lovers of All Stripes) is being published by Vintage Canada in early November. Nice to see the transition from website to book form: I've been checking in regularly to see what Martel has been selecting from Harper, but doing that is combursome. I'd much rather have something I can hold in my hands, leaf through, and take to the bookstore or library for reference. I'm not the only one, I'm sure. What to do when you only have 25 feet of frontage in the middle of the city? A lot actuallly as these photos of my neighborhors frontyards attest. The first is one that Jean-Claude Hurni began at least 25 years ago in front of the Hurnis' row house. It is a gorgeous, mature garden now, with a pond and a constant change of colour and texture. The second is one designed by Tri Du and his wife. 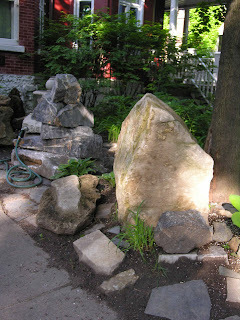 They put in a small fountain two years ago, and this year added some gorgeous rocks so big they took a crane to be put in place. 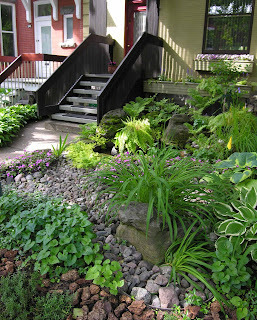 who with the help of a horticulturalist friend, have redesigned their front yard too. What a pleasure! One of the downsides to recession is the slump in prices for recyclable material. Last March the U.S. News and World Report asked the question: “Could the Recession Kill the Recycling Industry?” adding “High costs and bottled-up profits may push waste back to the landfills.” Even where governments continue to pay for recycling pick-up service (and many, particularly in the US, have cut back jobs) warehouses are bulging with paper, cardboard and other recyclables that are not selling very fast. Yesterday the Montreal city government announced that it will be opening its contract with the major recycler in order to help it weather economic tough times. The Gazette quoted the city council member in charge of the dossier, Alan DeSousa, as saying: “It is not in anybody’s interest to see these companies go bankrupt.” At one point recently, an environmental complex used by the firm was overflowing with 3,000 tonnes of collected, but not yet recycled, material. Under the new terms, the city will pay a subsidy of $35 a tonne, under a sliding scale, to a total expense of $3 million or until the average price per tonne exceeds $92.05 CAD. At that point the city will split profits with the firm. Collection is already a city responsibility. This morning one of the commentators on Radio Canada noted that the contract opening is only the latest in a number of announcements which can be seen as early campaigning for municipal elections in the fall. If so, that’s not a bad thing since it suggests that environmental issues appear to be hot button electroal issues. And, for sure, when ever times begin to look up, all that trash is going to be waiting for us, whether we dump in land fills, back yards, or simply store for a while until it can be sucessfully recycled. I'd opt for the latter, for sure. Yesterday’s mention of Stuart Robertson’s gardening books reminds me to tell those of you missed his last phone-in on Tuesday, that he is retiring from the CBC as of the end of this week. He’ll be missed, but his absence brings up a whole lot of questions about the future of Canada’s public broadcaster. Some 800 posts at the CBC and its French language equivalent Radio Canada were cut earlier this spring. Some of them were supposed to go through attrition, but others appear to have simply got pink slips. The slashes in staff and the inevitable changes in programming have raised a furor among listeners to Radio-Can. A petition collected 65,000 signatures on-line in 72 hours, and on Tuesday the Quebec legislative assembly unanimously passed a resolution calling for increased funding and respect of the long-standing mandate of the public broadcaster. Supposedly a campaign to save English-language programming will be launched next week, but to date the most vigorous response has come from areas like Northern Ontario where local programming will be cut. Elsewhere a ground swell of support has not yet materialized. Sadly, that is to be expected because over the last few years the CBC brass have systematically alienated its core audience in a misguided attempt to attract younger listeners and viewers. The result is pitiful. Take the most depressing case, that of Radio Two, which formerly broadcast serious music and now has "lightened" its offerings. In markets where its station competes with an all classical station, it's the latter that has gained strength, not the former. In Montreal, Radio Two had 2.3 per cent of Anglophone listeners in the fall, but 2 per cent in the period January 26 to April 26. The all-classical station which broadcasts in French, on the other hand, went from 3 per cent to 3.3 among Anglos and from 4.3 to 4.7 among Francophones. More than a year ago when the CBC announced its remake of Radio Two, Globe and Mail columnist Russell Smith mused: “a radio station that is indistinguishable from commercial stations will have no reason to receive government support. Why not just shut it down already?" That appears to be what is happening now, with the government of Stephen Harper looking on approvingly from the sidelines. The CBC has become of such marginal relevance to its Anglophone listeners that people don’t care, except where-- some how, because of some good management choices perhaps—the peculiar needs of a real community have been addressed. The end might not be coming for Radio Canada because it has been more successful—or wiser—in understanding what is special about its audience. But if the CBC is to survive, the people in charge are going to get back to their real mandate of informing, entertaining and supporting the intellectual and cultural life of the country. In other words, get back to nurturing Canada's soul. What about a petition about that? The combination of thinking about librarians and Eleanor Perenyi brings up the topic of good gardening books. While I would recommend Green Thoughts: A Writer in the Garden to anyone, there are other books about nature which seem to me to be must-reads for anyone who likes either gardening or the natural world. The first in time is The Voyage of the Beagle by Charles Darwin. You can find it online, but I recommend reading it in a paperback version that you can take with you anywhere, the Penguin Classic edition for example. This is a book to dip in and out of in the afternoon when it's too hot to do anything or just before you go to sleep. The Darwin who wrote it was in his twenties, and his observations brim with energy and intellectual curiosity. The connection with gardening may not be immediately apparent, but anyone who enjoys discovering the natural world will be entranced by Darwin's green thoughts. The second is Gardening through the Ages by Penelope Hobhouse. It’s subtitled An Illustrated History of Plants and Their Influence on Garden Styles—from Ancient Egypt to the Present Day. This is not a book that you can stick in a backpack or the pocket of a jacket. Rather it's a book to bring out when you can sit comfortably and look at its lovely illustrations and consider the history that Hobhouse gives us. Then there’s In Search of Lost Roses by Thomas Christopher He tells about rose rustling and the discovery of roses lost but not forgotten. A delightful, personal book that makes you want to go out and see what you can find in your neighborhood. And for those of you who read French, see if you can find Tous les jardins du monde by Gabrielle Van Zuylen. It is one of Gallimard’s Découvertes series, a high quality, relatively inexpensive line of paperbacks for a mass market audience, 1 It starts with Babylon, and I found it full of interesting references when I was working on my own Green City: People, Nature and Urban Places. As for standard references, I like the Reader’s Digest illustrated guides, which have a Canadian edition that is very useful for our difficult climate, not to mention two little books by my friend Stuart Robertson, Tips on Container Gardening and Tips on Organic Gardening. There are others, I'm sure, and as they occur to me I'll post them. What do you do when a nicely dressed, intelligent-looking woman smiles at you? Smile back and wonder where you know her from? That’s what I found myself doing the weekend after I got back from Portugal. Local librarians had organized a book signing at the Canadian Library Association’s convention held at Montreal’s Palais de Congrès. When I entered the grand entrance hall, I found myself face to face with a woman in her late 40s, who was headed out for a break in the sunshine (or so I decided later.) She smiled at me and I smiled back automatically. Then I tried to figure out who she was. She looked vaguely familiar, and I thought maybe she was someone I’d met at a literary event. But my musings were interrupted a few steps farther on when two equally pleasant-looking women who had been talking to each other, smiled at me as they passed. Same thing over and over again, until I found the place where we writers were to sit. As we waited for the hordes who wanted signatures (which never materialized, sad to say) I began to notice that everyone was smiling. That’s when the penny dropped: librarians are supposed to smile, they’re supposed to be welcoming. In my travels,, one the premises on which I operate is that I greet all women I meet on the street and ignore all men. Doing that opens up the chance of conversation with locals, but avoids being hassled by men who misinterpret my openness. Librarians, on the other hand, operate on a corollary: that a smile is a great first step to hooking someone on their great passion—reading. How lovely! What a great déformation professionelle! There are books that mark you because they crystallize what you’ve been thinking about a subject, or because they lead you deeper into a particular world of endeavor. Green Thoughts: A Writer in the Garden by Eleanor Perenyi was one such for me. For the first part of my life I took gardens and flowering plants for granted—they were part of the landscape, part of the set on the stage of my life, but no more real or important that the cut-out trees toted by the advancing hordes in Macbeth. But some time in my 30s I fell in love with plants, and began trying to grow them indoors in this wintry climate and outside during the far too short summer season. Perenyi’s book was published when I was in the throes of trying to figure out how to make the most of a small city garden plot. Her essays on compost inspired me to keep at it: my chicken-wire contraption is probably the oldest in my neighborhood, and whatever gardening success I have is, in part, owed to it. But Perenyi also linked gardening to the wider world, with an essay on the origin of peonies, and ruminations on dahlias and the wisdom of using a push mower instead of a power one. Over the years I’ve returned to the book frequently, for ideas, encouragement and pleasure. It is fittimg--and perhaps not accidental--that she died just as the North American spring burst forth. 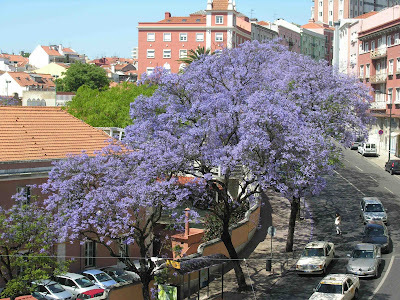 When I was in Lisbon the jacaranda were in bloom everywhere. Used as foliage trees in some parts of the US where they do not thrive, these South American natives are truly spectacular when conditions allow them to bloom. In my Southern California childhood there were a few, but nowhere near as many as the thousands which line Lisbon's old streets. This is my 631st post, two years after I started this exercise on June 5, 2007. The beginning was sort of a joke: at the Writers' Union of Canada annual general meeting that year, I sat next to Marc Côté of Cormorant Books during a workshop on the promotional uses of the internet. We'd recently signed a contract for The Violets of Usambara (the novel which Cormorant brought out in March 2008) and we laughed about what a blog about African violets might do to sales. As I've said here before, while I very much enjoy plants and nature, I'm no avid African violet fancier--there are three plants blooming at the moment but that's my personal best--so it was clear it would be false advertising to blog about them. The idea of writing regularly about whatever interested me appealed, however. All these posts later, the blog has become a place to rant, to reflect and to try out things I'm working on. It probably has kept my friends and family from long conversations about things that may be of only marginal interest to them. It also has led me to virtual friendships with a number of people I would never have encountered otherwise. While the half hour or more it takes to do a post has to be snatched from the rest of life, on balance I think it's been worth it. Thanks for stopping by to read what's on my mind! There’s a lot in the press about this being the 20th anniversary of the massacre at Tiananmen Square, and rightly so. But there are a number of things that put that event in perspective. One is the fact that on the same day, Poles, to everyone’s surprise elected majorities of the opposition party Solidarity. This was definitely the beginning of the end for Communism. By the fall, the Iron Curtain was down and the world had changed profoundly politically with repercussions we feel still today. Another thing to remember is that Tiananmen was in many respects the swan song of old style Chinese Communism, the last gasp of aging rulers who saw which way the wind was blowing. In a few years time the China would buy into capitalism in a big way. While repression continues on many fronts, most observers would say that the Chinese are much better off now than they were then. And finally, since we’re talking about revolution, bloody and otherwise, I’d like to share with you the trailer to a film made in 2000 about Portugal’s Carnation Revolution of 1974, The Captains of April. Four people were killed in it, but as you can see from the clip, people put down arms and took up flowers. A wonderful reminder that change can come peacefully. It was a thrill last week to stand where it all began: see the picture above. In the May 4 New Yorker Malcolm Gladwell has another of his fascinating articles about how to accomplish things, “How David Beats Goliath.” (The special issue was about innovation and I took it with me on my trip: great reading for long airplane flights.) This time he takes off from a story about an unlikely basketball coach and team that won big because they played very hard using unexpected tactics. How? By looking for the enemy’s weaknesses, not playing by the enemy’s rules, and working very, very hard, Gladwell concludes. While basketball pervades the article—and provided fertile ground for a wealth of comment on Gladwell’s blog—he also uses Lawrence of Arabia and war games to make his point. It seems to me that over the last few years Gladwell has been preparing a large body of advice for people who want to change the world. I intend to do an essay on that for the online magazine Rover soon, but suffice to say now that I find him one of the most subversive writers around. And the wisdom of his argument in this article came home, as I delved into the other reading I took on my trip, The Lusiads by Portugal’s great epic poet Luis Vaz de Camões. That’s how the Portuguese won many battles against the Moors, the poet says—by wily intelligence, unexpected tactics and valour. Old ideas, it seems, sometimes are the newest thing. This morning I walked over the St. Mary’s Hospital to have some routinue blood tests—a 45 minute walk on an empty stomach that I rewarded with two eggs sunny-side up, sausage and home fries afterwards. The good breakfast, however, didn’t keep mind from my thoughts of breast cancer. Quebec is currently buzzing about the revelation that a number of labs evaluating tissue from breast cancer operations have not been consistent in their findings. In an ideal world, all samples would receive the same rating after evaluation no matter where they were tested, but it looks like up to 30 per cent differed from the consensus. This could meant that many women received inappropriate treatment. The latest development is a promise from the health minister that the tests will receive outside evaluation in future. Three years ago I was just a few days from having an excision of breast tissue for ductal carcinoma in situ, and, while I was sure I was going to be all right (I’m congenitally optimistic) I approached the operation with some trepidation. The surgery did not take place at St. Mary’s because it doesn’t do such operations, but at a hospital nearby, while I received the five weeks of radiation which followed at still another hospital. All are within walkable distance from chez nous, and the daily walks through the summer mornings helped my speedy recovery, I am sure. Since then I’ve been insisting to every woman of a certain age whom I know that she have regular mammograms. My DCIS, while it appears not to have been truly dangerous, would never have been picked up without a mammo. Had it not, I might now be facing a much more serious situation with a more advanced cancer. Instead of blithely enjoying the walk this morning, I might be consumed with worry—and not at all certain that the message I would get when the tissue sample results came back would be reliable. Certainly my treatment options would likely be more drastic than the treatment I received and which seems to have been right one. Back from Portugal to find the garden overgrown and a mass of news to digest. While in Lisbon I watched far more television than I do here, largely to work on my Portuguese comprehension. Canada made the news a couple of times—a second death due to AH1N1, the Stanley Cup finals (only on BBC sports,) Alice Munro winning the International Man Booker, J’ai tué ma mère running away at Cannes and the CAW making more concessions to GM. Other big stories here didn’t rate a mention there. It’s going to take me a while to digest what’s happened, to say nothing about making sense of what I learned in Lisbon. But I was struck by one observation I made there as I watched fishermen on the Tagus River—the mass of plastic and tangled abandoned fishing line floating at high tide—and a most interesting story by Louis-Gilles Francoeur in last Friday’s Le Devoir which was waiting for me when I got home. In it he cites a United Nations study showing that 650,000 tons of discarded fishing gear now are floating on the oceans’ waves, making up about 10 per cent of all detritus that is seriously harming their health. The report was issued in early May, although I haven’t seen mention of it anywhere. The international community must take effective steps to deal with the problem of marine debris as a whole, it quotes Ichiro Nomura, FAO Assistant Director-General for Fisheries and Aquaculture. “There are many ‘ghosts in the marine environment machine' from over fishing and acidification linked with greenhouse gases to the rise in de-oxygenated ‘dead zones' as a result of run off and land-based source of pollution, ” adds UN Environment Programme Executive Director Achim Steiner. 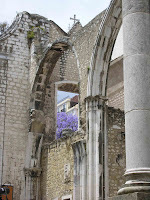 Lisbon was settled 2,000 years ago or more where the Tagus enters the Atlantic Ocean. 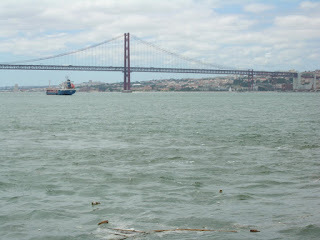 The sea-going prowess of the Portuguese was honed in the great river’s waters. That it is polluted is not surprise, but it is a terrible shame. By the way, that's the suspension bridge now called the April 25 th Bridge, after the day when Portugal had its most effective and quiet revolution in 1974. More about that later probably, but in the meantime note how much it looks like the Golden Gate. If I were to sum up my impression of Lisbon in a phrase it would be: a smaller Paris set down in California.